Crafted from top grain saddle leather and polished to perfection, this wine journal opens to reveal 96 rustic pages in which the wine label can be affixed, and lines to record the vintage, vintner, country, taste, bouquet, body, appearance, aroma, date and place, price, occasion, pairings and comments. With enough pages to record the tasting of over 40 wines, this convenient journal will quickly become a constant companion. One Genuine Leather Wine Log. Complimentary Personalization on Leather Cover. Your gift is securely wrapped to safeguard the shipping process and arrives presentation-ready. A complimentary card with your personal message is included with your gift. Free Embossing! Select up to 20 characters to be embossed on leather surface. Enter information to be engraved using the personalization option during checkout. Journal Measures 4" x 8". Embossed Leather Wine Log is a hand delivered gift. These gifts are delivered by one of our local design centers located throughout the United States and Canada. Same day delivery is available for most gifts when ordered before the cutoff time. The cutoff time for Embossed Leather Wine Log is 2 PM in the recipient's time zone. Saddle Leather Wine Log by RusticoHand-sewn and crafted from top grain leather, this wine log has enough space to record the details and affix the labels of over 40 wines. 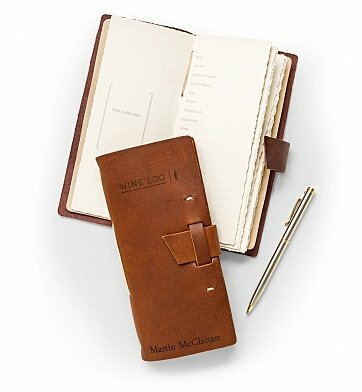 100% genuine leather wine journal, handcrafted in the USA by Rustico. Complimentary embossing of your chosen name, date or message on cover. Includes a complimentary card with your personal gift message or greeting. I absolutely love this wine log. It is exactly as the description is and just what I expected and hoped it would be. I will definitely be using GiftTree again for future purchases!